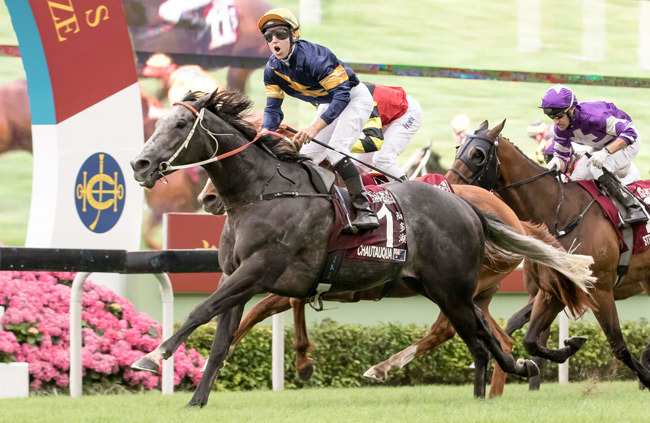 After missing the start and being pushed wide on the turn, Chautauqua came from tailed off last for a career-defining victory in Sunday’s $HK10,000,000 Group 1The Chairman’s Sprint Prize (1200m) at Sha Tin. On a track that had been playing to the leaders all day, Chautauqua could not get warm early. Tommy Berry was heeling him along to stay in touch as the leaders set a furious pace, which was the downfall of Buffering who weakened to finish at the tail of the field. Few sprinters anywhere in the world could withstand Chautauqua’s spine-tingling burst of acceleration and it was the progressive Sebring gelding Lucky Bubbles that was in the sights of the Aussie champion. With the Hawkes training team and connections on their feet in the stands, the 5yo son of the pensioned Encosta de Lago blew past Lucky Bubbles to win by a neck with Fastnet Rock’s 4yo son Strathmore a length back in third. “What did we just see?” Berry exclaimed. “I can’t believe he did what he just did. Bred and part-owned by the Throsby family, Chautauqua was consigned to the Inglis Australian Easter Yearling Sale where he failed to make his $400,000 reserve. A half-brother to Group III winner London Lolly, Chautauqua is the sixth foal of Lion Hunter mare Lovely Jubly a top-class 2yo in 2002 claiming a Group 1 double in the QTC Sires Produce Stakes and TJ Smith Classic in addition to wins in the BTC Champagne Stakes and Magic Millions 2yo Classic. Lovely Jubly has a 2yo filly by More Than Ready (USA) named Mulberry Walk. Her foal by All Too Hard was born dead and she was covered by More Than Ready (USA) in November.